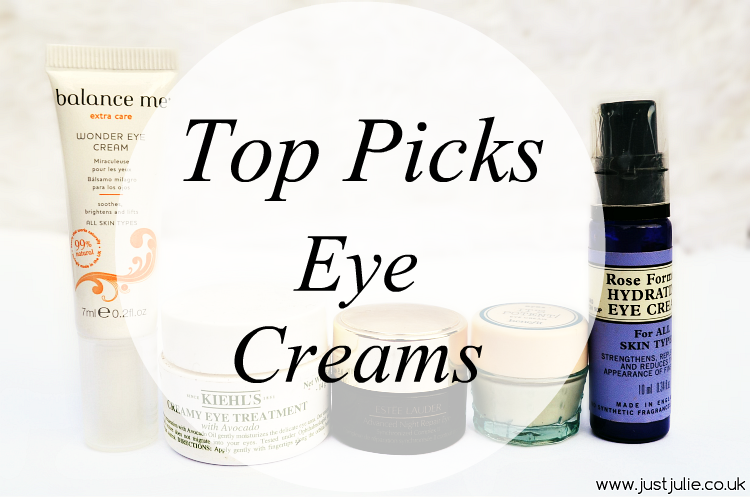 It's been a while since I've posted a Top Picks, so I thought I'd make a come back with a category that has pretty much dominated the past two years of my life... eye creams. 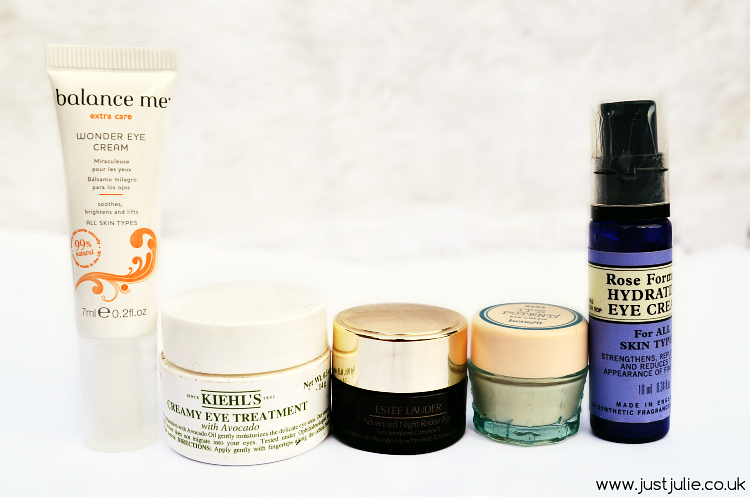 Having tried and sampled many different brands I believe I have narrowed down my favourite eye creams . I've mentioned here on JustJulie many times about my concerns with under eye area. I'm approaching 33 (next Wednesday) so yeah of course I'm concerned about those fine line and wrinkles that seem to increase on a daily basis BUT my biggest concern is that my under eye area is very dehydrated, which as a result makes those fine lines appear a whole lot worse than what they really are. I already know ways that I can improve my dehydration and believe me I'm trying. One thing I know would help is to have more sleep, but I've had issues with my sleep for many years, it's kind of out of my hands! So what I want is an eye cream that will rehydrate my under eye area, brighten up my eye area and also help prevent those fine lines and wrinkles from developing even more. Anyone would think that was an easy task, but having tried a number of different eye creams, it's actually not. One problem I faced with hydration is that a lot of eye creams were too thick and actually clogged up my eyes area and gave me reactions which left my eyes looking and feeling very dry and sore. Not what I wanted at all. Kiehl's Creamy Eye Treatment with Avocado, From £20 I actually mentioned this in my Skincare Regime post back in the summer just HERE and I'm still in love with this eye cream. This is the one eye cream that reduced my dehydration almost immediately and still continues to do so. It's a rich eye cream yet it's not to thick. It absorbs almost immediately and leaves my eyes looking brighter. I just wish this was anti-aging and then it would be the best eye cream around! Estée Lauder Advanced Night Repair Eye Synchronized Complex II, £40 This is actually a sample that I was given at work, that's actually lasted me ages. I think due to the price I made sure I didn't use this up straight away! The first time I used this I used it at night and then again in the morning and I'm not lying when I say I could see and feel a visible difference immediately, in fact others noticed a difference too. Damn this brightened up my eyes and also made them feel smoother and firmer straight away. I love the gel like texture to this, which I think helps to soothe my eyes straight away. I think this is amazing and believe if I used this every day for a few months my lines would be reduced, that's how much of a difference this made after using it for two weeks straight, it's just the price tag that has prevented me from buying the full size. But if you're after an amazing eye cream that visibly shows a difference immediately and will continue to do so and money isn't an object then this is the eye cream you need in your life right now! Benefit It's Potent! Eye Cream, £25.50 I received this in my September Birchbox, which I reviewed just HERE and I was super excited about this. (note to self, I've just noticed I had this marked up as the August edition!!) The blogging world has been raving about this eye cream for ages now and I couldn't wait to see if this was worth all the hype and it really is! In fact I've just ordered the full size this week! This has really helped brighten my eyes and reduce the darkness. It also works wonders on hydrating my eye area too. I think this is bloody amazing to be honest and is worth every penny! Neals Yard Rose Formula Hydrating Eye Cream, £23.75 This is meant to help reduce lines, however I'll be honest I've not noticed any change on that front but maybe I will eventually. What it does do is help soothe my eyes and hydrate them too, even with this being a very lightweight eye cream. What eye cream do you love and recommend I should try next?